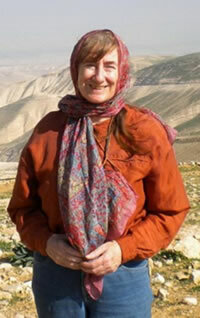 Mary Gardner, 55, was studying at the Hebrew University in the city in her work as a Bible translator. She was caught up in the blast on Wednesday when a bomb exploded across the street from the Jerusalem Convention Centre. Mary, from Orkney, was an evangelical Christian who spent much of her life living in the African country of Togo, where she worked for Wycliffe Bible Translators. -from the article in The Guardian. But we know what glory awaited her. In the Graham interview with Larry King that I link to below, Graham said a remarkable thing: that he would not want to live a moment longer than God, in God's sovereignty, appointed for his life. I thought about that as I read this article, and reflexively deplored her death. We remember, then, that God has a purpose for each of his children, that God is righteous, just, and loving. Somehow, even in that horrible moment on the streets of Jerusalem on Wednesday, his will was being expressed. I remember my dear Aunt Frances, at the time of the death of our baby denying that God could have had any hand in it. I didn't argue with her. But I knew he did, and I bowed my head to his will, even as I grieved as I never had before in my life nor ever have since. I thought of that little girl, whose entire life on earth was spent in her mother's womb. That was such a comfort. And as I see how God has blessed Carol and me with the children God gave us later, our daughters-in-law still later and their families and friends, and our precious grandchildren, what can we do but lift up our hands to him in thanksgiving? And so we do for our sister Mary of Orkney.